A few of us at Team Seagrass have been doing fieldwork in Northern CA in order to collect seagrass relatives. We have specifically been targeting freshwater species (highlighted in blue in the below phylogeny). We will continue with marine and brackish species when the tides in the San Francisco Bay are lower. 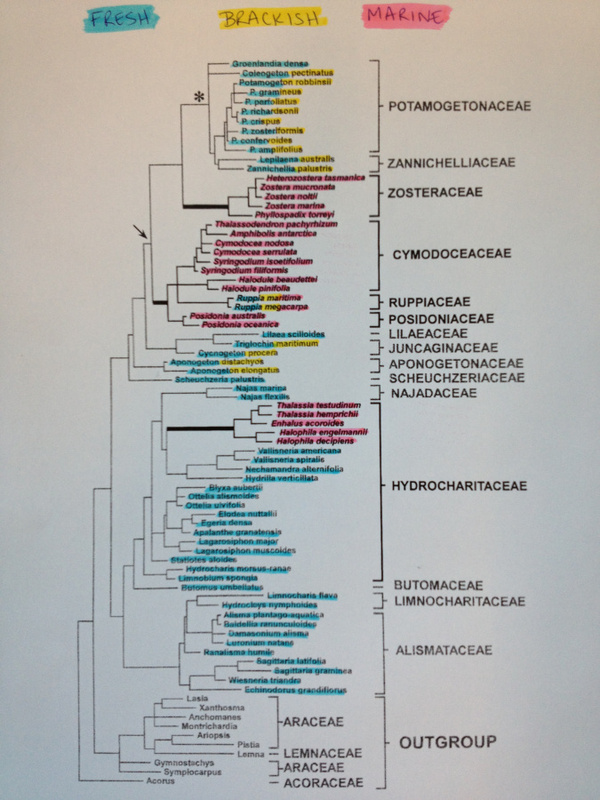 From https://phylogenomics.wordpress.com/people/post-docs/jenna-lang/seagrass/photo-4/: This is a phylogeny of the Alismatales, including the seagrasses and their aquatic relatives. This tree was built using parsimony and ~1200bp alignment of the rbcL gene. From Les and Cleland, 1997. We have been following the methods detailed in https://seagrassmicrobiome.org/sample-collection-and-preservation/ and have managed to collect a few representative species from the following clades: Potamogetonaceae, Alismataceae, Hydrocharitaceae, Najadaceae, and the Lilaceae. For further plant identification and the construction of a ‘host phylogeny’ we will be using chloroplast DNA markers. In addition to what we have sampled thus far, we have also managed to sample some outgroups (Myriophyllum, Ceratophyllum, and Camboba). We will hopefully be able to sample additional outgroup species shown on the above tree. We have been successful in 7 out of the 10 locations that we have tried. The lack of success so far can be attributed to drought conditions in CA and the increase in invasive submerged aquatic vegetation (e.g. Myriophyllum, Water Milfoil; and Eichhornia crassipes, Water Hyacinth). Water Milfoil and Water Hyacinth form dense mats below and above water, respectively, outcompeting native vegetation. Even in sites where we been successful, much of the area we surveyed has been overrun with these two invasive species. Obviously drought has also been an issue for us, as many of the lakes and tributaries have little to no water in them this year, resulting in a lack of any aquatic vegetation. Water levels in Folsom Lake, for example, are so far reduced that the Park Service has had to build additional parking lots on the water side of the boat ramp in order for people to be able to get close to the new shoreline. 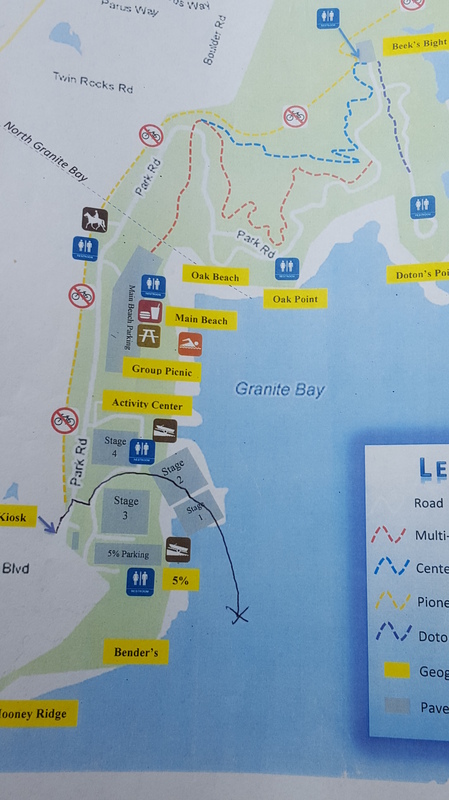 Map of Folsom Lake, with parking instructions drawn on by park official. X marks location of new parking lot, which is still at 15 minute walk to the shoreline. In the following weeks we will head up to the foothills in search of remaining freshwater species, as well as explore the Bay Area coastline and salt marsh/Delta area for marine and brackish species. Stay tuned!